Preteens and teens (11-14 yo) are more likely to activate 'social cognition' areas of the brain when reflecting about themselves ("I am smart", "I am popular"), meaning that they reflect the opinions that they feel their peers or parents have. In the figure at the right, for instance, kids more closely mirrored what they thought their best friend thought of them, vs. adults who seemed to have a different appraisal of themselves compared to what they thought their friends thought of them. In trials involving domain-specific knowledge (e.g. whether mom thought I was smart or whether my best friend thought I was popular), brain fMRI activity seemed to mirror the relevant domain-specific perspective. 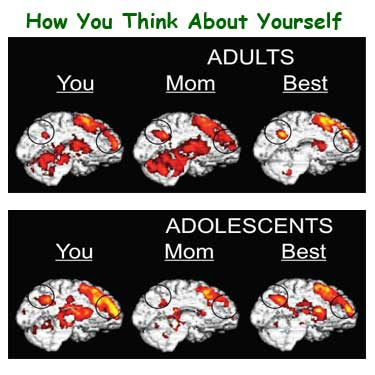 It's striking to see how differently kids self-belief is their perceived mothers' beliefs about them...Also with the much lower activation of the temporal lobes for adolescents, it makes you think that adolescents are likely to make more quick self-appraisal opinions about themselves vs. adults who draw on more previous experiences (episodic memory) to inform how they think about themselves.